The TrafFix Water-Cable Barrier is designed with three (3) molded in galvanized steel cables that strengthen the water-cable barrier to resist vehicle penetration during an impact. The hinges are designed to allow a 30° pivot between sections and each hinge features a double wall knuckle design that greatly minimizes breakage. Each wall includes one (1) galvanized steel T-pin to securely link Water-Cable Barrier sections together. 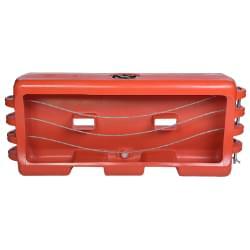 The large 8" fill holes speed up the filling process reducing setup time in dangerous roadway workzones. The tamper resistant drain plug has coarse buttress threads that eliminates cross threading and allows for quick insertion or removal with only 2½ turns. 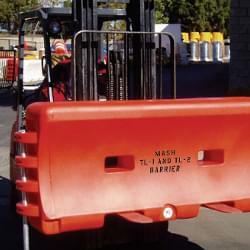 With large forklift/pallet jack slots, the water-cable barrier is easy to move when empty or full — further reducing time spent in workzones. 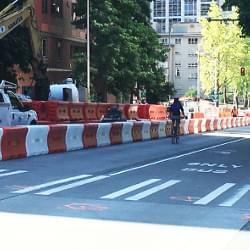 The water-cable barriers can be stacked, while empty, for easy storage and transport to and from job sites. Made from durable UV resistant polyethylene plastic, the TrafFix Water-Cable Barrier prevents breaking, cracking, and fading in most weather conditions. 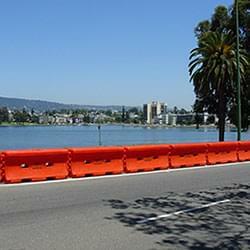 The TrafFix Water-Cable Barrier is 72" (1.9 m) long × 18" (0.46 m) wide × 32" (0.8 m) tall and is molded from polyethylene plastic. The Water-Cable Barrier is MASH tested, passed, and eligible for TL-1 31mph (50 km/hr) and TL-2 43.5 mph (70 km/r) barrier applications. Each individual wall weighs 100 lbs (45.4 kg), including internal cables, empty and 1,070 lbs (485.3 kg) when filled. 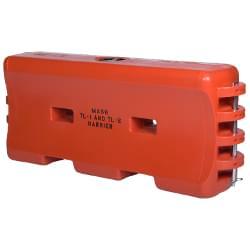 Three (3) &frac38;" diameter stranded steel cables are molded into the wall to contain the impacting vehicle during an accident. 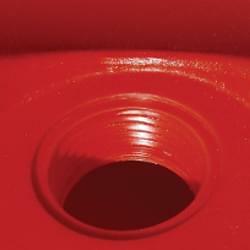 Standard colors are orange/red and white, product may also be produced in other colors. 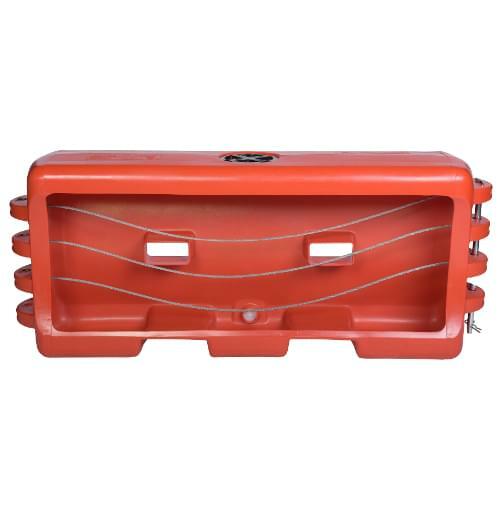 The TrafFix Water-Cable Barrier modules are connected together with galvanized steel T-pins passing through a double wall knuckle which minimizes breakage at hinge points. 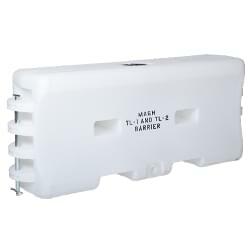 Water-Cable Barrier shall pivot up to 30° when connected. 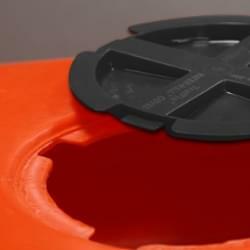 Water-Cable Barrier will have one (1) 8" (20.3 cm) diameter fill hole for quick filling and a twist lock cap for secure closure. 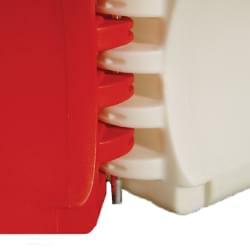 The TrafFix Water-Cable Barrier has molded fork lift slots to provide easy movement. The drain plug is centered on the module to protect against cracking or breaking and features course buttress threads for quick removal and insertion. 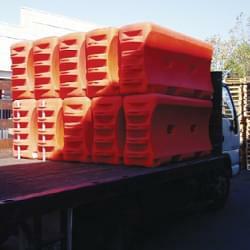 The Water-Cable Barriers are stackable for easy movement and storage.